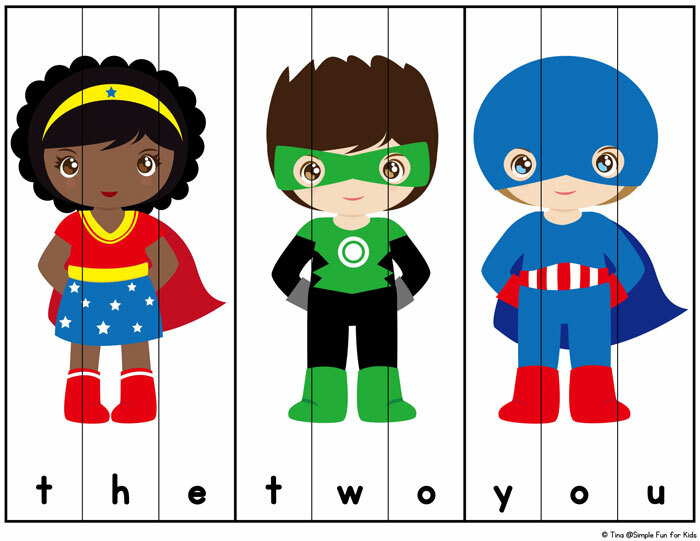 Did you see my Superhero Graphing Game I shared last week? 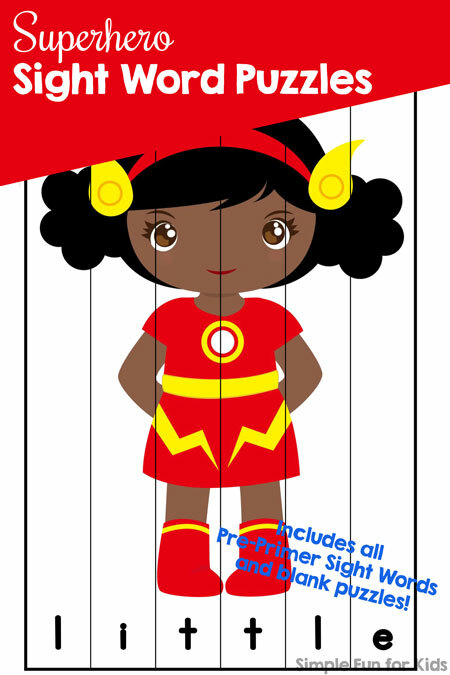 I just love how this printable turned out, and it reminded me of this super cute superhero clip art that I hadn’t used in quite a while. Dry erase marker or permanent marker (optional). The printable has 42 sight word puzzles on 15 pages. I’ve included all 40 pre-primer sight words plus 2 blank puzzles you can add words of your choice to. There are two 6-piece puzzles, four 5-piece puzzles (one of them blank), twelve 4-piece puzzles, twelve 3-piece puzzles, and twelve 2-piece puzzles (one of them blank). Each sight word except the one letter words have one letter on each puzzle piece. The one letter words “a” and “I” are on 2-piece puzzles with the letter on the line between the two pieces. After you download the file, print the page(s) you want to use. Laminate the page(s) for durability and better handling. Cut the puzzles apart along the black lines. Note that there are thicker lines between different puzzles on the same page. You can mix different puzzles for an extra challenge. The individual superheroes do repeat, but never on the same type of puzzle. Purchase Your Printable Right Now!